What's new in Hibernate Validator 4.1? I'm very proud to report that today Hibernate Validator 4.1.0 Final has been released. Besides many bug fixes this release adds also a lot of new features to the code base. @CreditCardNumber: Validates that a given String represents a valid credit card number using the Luhn algorithm. Useful to detect mis-entered numbers for instance. @NotBlank: Validates that a given String is neither null nor empty nor contains only whitespaces. @ScriptAssert: Allows to use scripting or expression languages for the definition of class-level validation routines. Let's have a closer look at the @ScriptAssert constraint, which I'm particularly excited about as I have implemented it :-). The intention behind it is to provide a simplified way for expressing validation logic that is based on multiple attributes of a given type. Instead of having to implement dedicated class-level constraints the @ScriptAssert constraint allows to express such validation routines in an ad hoc manner using a wide range of scripting and expression languages. In order to use this constraint an implementation of the Java Scripting API as defined by JSR 223 ("Scripting for the JavaTM Platform") must be part of the class path. This is automatically the case when running on Java 6. For older Java versions, the JSR 223 RI can be added manually to the class path. So all you have to do is to specify a scripting expression returning true or false within the script attribute. The expression must be implemented in the language given within the language attribute. The language name must be the language's name as registered with the JSR 223 ScriptEngineManager. Within the expression the annotated element can be accessed using the alias _this by default. As shown the @ScriptAssert constraint allows to define class-level constraints in a very compact way. But there is also a price to pay. As scripting languages are used, compile-time type-safety is lost. When for instance the startDate attribute is renamed the script expression would have to be adapted by hand. Also evaluation performance should be considered when validation logic is getting more complex. So I recommend to try it out and choose what ever fits your needs best. The Bean Validation API defines the MessageInterpolator interface which allows to plug in custom strategies for message interpolation and resource bundle loading. As it turned out, most users only want to customize the latter aspect (e.g. in order to load message bundles from a database) but would like to re-use the interpolation algorithm provided by Hibernate Validator. Therefore Hibernate Validator 4.1 introduces the interface ResourceBundleLocator which is used by HV's default MessageInterpolator implementation ResourceBundleMessageInterpolator to do the actual resource bundle loading. Here messages from bundles "foo" and "bar" could be used in constraints. In case the same key was contained in both bundles, the value from bundle "foo" would have precedence, as it comes first in the list. If a given key can't be found in any of the two bundles as fallback the default locator (which provides access to the ValidationMessages bundle as demanded by the JSR 303 spec) will be tried. Using the Bean Validation API constraints can be declared using either annotations and/or XML descriptor files. 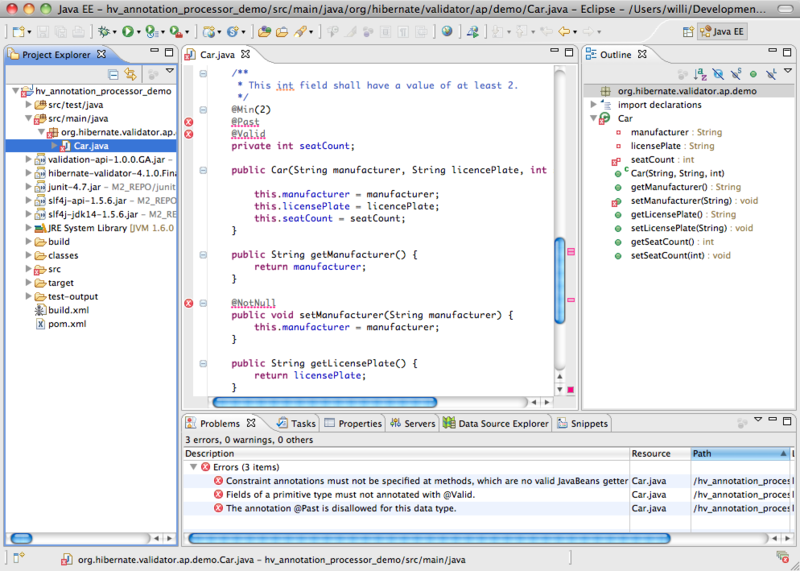 Hibernate Validator 4.1 introduces a third approach by providing an API for programmatic constraint declaration. This API can come in handy for instance in dynamic scenarios where constraints change upon runtime or for testing scenarios. As the listing shows the API is designed in a fluent style with the class ConstraintMapping as entry point. Constraints are declared by chaining method calls which specify to which property of which type which constraints should be added. The API provides constraint definition classes such as NotNullDef etc. for all built-in constraints, which allow to access their properties (min(), message() etc.) in a type-safe way. For custom constraints you could either provide your own constraint definition class or you could make use of GenericConstraintDef which allows to identify properties by name. If you now use this validator to validate an Order object which has no customer set a constraint violation will occur, just as if the "customer" property was annotated with @NotNull. Normally you would notice such mistakes only during run-time. The annotation processor helps in saving your valuable time by detecting these and similar errors already upon compile-time by plugging into the build process and raising compilation errors whenever constraint annotations are incorrectly used. The processor can be used in basically every build environment (plain javac, Apache Ant, Apache Maven) as well as within all common IDEs. Just be sure to use JDK 6 or later, as the processor is based on the "Pluggable Annotation Processing API" defined by JSR 269 which was introduced with Java 6. Just for the record it should be noted that the annotation processor already works pretty well but is currently still under development and is considered as an experimental feature as of HV 4.1. If you are facing any problems please report them in JIRA. Some known issues are also discussed in the reference guide. The focus for Hibernate Validator 4.0 was to provide a feature-complete, production-ready reference implementation of the Bean Validation spec. While strictly staying spec-compliant, HV 4.1 goes beyond what is defined in JSR 303 and aims at generating even more user value by providing new constraints, new API functionality as well as an annotation processor for compile-time annotation checking. In order to try out the new features yourself just download the release from SourceForge. Of course HV 4.1 can also be retrieved from the JBoss Maven repository. If you are already using HV 4.0.x, the new release generally should work as drop-in replacement. The only exception is that we had to move the class ResourceBundleMessageInterpolator to the new package messageinterpolation. So if you're directly referencing this class, you'll have to update your imports here. Of course we'd be very happy on any feedback. Questions and comments can be posted in the HV forum, while any issues or feature requests should be reported in JIRA. With the help of Oracle's extractValue() function one can retrieve values from XML documents stored in a database using XPath expressions. Generally this function works as expected but it gave me a hard time when XML namespaces came into play. As I didn't find much related information on the web I thought a short example might be helpful for others facing the same problem. 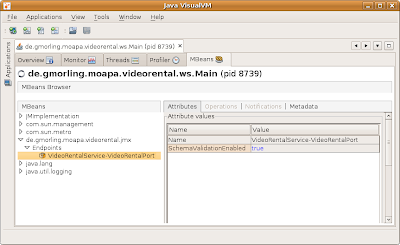 Let's take the web service from the video rental shop from my recent post Integrating JAX-WS with XmlBeans as example. Here we have two namespace aliases declared, soapenv for the SOAP message and typ for the actual message content. The key for accessing values from this document using extractValue() is the pretty poorly documented optional parameter namespace_string, which can be used to declare any namespaces. This has to happen in the form xmlns:alias="URI", multiple namespaces must be separated by a space character. Amongst others the Bean Validation API defines two constraint annotations related to time: @Past and @Future. With the help of these constraints one can validate that a given element is a date either in the past or in the future. As per the BV specification these constraints are allowed for the types java.util.Date and java.util.Calendar. But what if you are working with an alternative date/time library such as the Joda Time API? Does that mean you can't use the @Past/@Future constraints? Luckily not, as the Bean Validation API defines a mechanism for adding new validators to existing constraints. Basically all you have to do is to implement a validator for each type to be supported and register it within a constraint mapping file. Note that for the remainder of this post I'll focus on the @Past constraint. Doing the same for @Future is left as an exercise for the reader. So let's start with implementing a validator. The Joda Time API provides a whole bunch of types replacing the JDK date and time types. A good introduction to these types can be found in Joda's quickstart guide. All Joda types representing exact points on the time-line implement the interface ReadableInstant. Providing an @Past validator for that interface will allow the @Past constraint to be used for widely used ReadableInstant implementations such as DateTime or DateMidnight. Similar validators could also be written for other Joda types which don't implement ReadableInstant (such as LocalDate) but as this is basically the same, it is out of the scope of this post. Using the validated-by element we add our new validator to the validators for the @Past constraint. By setting include-existing-validators to true, we ensure that the @Past constraint still can be used at the JDK date types. The complete source code in form of a Maven project can be found in my Git repository. So just try it out and don't hesistate to post any feedback. 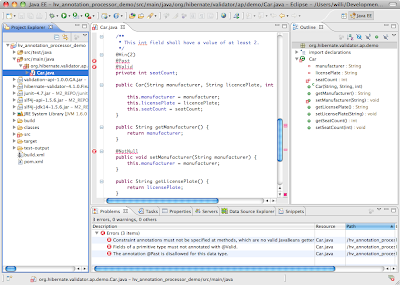 It is also planned to add support for the Joda types in an ucoming version of Hibernate Validator.